Following last Tuesday’s jihadist massacre of four rabbis and a police officer at the Bnei Torah Kehillat Yaakov synagogue in Jerusalem, Prime Minister Binyamin Netanyahu ordered law enforcement bodies to act immediately to destroy the homes of the two terrorist murderers who carried out that attack. He also directed them to destroy the homes of the terrorists who carried out the three other recent attacks in Jerusalem. The following day, police destroyed the home of one terrorist murderer. Two more homes were supposed to be destroyed in short order. But then the EU-funded radical leftist NGO Hamoked – Center for the Defense of the Individual petitioned the Supreme Court, sitting as the High Court of Justice, opposing the orders. Wednesday the court issued an injunction prohibiting state authorities from carrying out the house demolition orders. In directing law enforcement officials to carry out the home demolitions, Netanyahu argued that the move serves as a deterrent to future would-be terrorists. Whether or not he is correct is a matter of debate. But certainly the Supreme Court can’t determine the effectiveness of the move better than the IDF can. And the IDF’s official position is that destroying the homes of terrorists deters potential terrorists from attacking. And yet, rather than recognize the limitations of their own wisdom, Supreme Court justices acted on the behalf of an EU-funded radical organization that represents no significant constituency in Israel, and overruled the democratically elected government, curtailing its power to take the measures it deems necessary to protect the public. This of course was just the latest move by the court to arrogate to itself the powers duly conferred on the public’s elected representatives in the government and the Knesset. In September, the court ruled on another petition brought before it by radical left-wing NGOs funded by the EU and other foreign actors. In its jaw dropping decision to strike down the “Infiltrators Law” amendment to the 1954 Prevention of Infiltration Law, and order the closure of the state’s holding facilities for illegal aliens from Africa, the court effectively denied the people’s elected representatives the power to determine Israel’s immigration policies. In so doing, the court hollowed out the public’s right to self-determination. It also diminished Israel’s democratic system of government. A body politic barred from determining who may dwell within its boundaries is not a free, democratic society. The court also weakened Israel’s long-term viability as the Jewish state. A Jewish state unable to prevent the dilution of its Jewish majority through the illegal mass immigration of predominantly Muslim Africans is a Jewish state with a dubious future. This of course brings us to the current hullabaloo about the draft legislation of the Nation-State Law. Supporters of the draft legislation that seeks to give a constitutional anchor to Israel’s identity as the nation-state of the Jewish people argue that the law will weaken the court’s power to undermine Israel’s Jewish identity. The problem with assessments like these, which inform the political Right’s dedication to the bill, is that they have no basis in reality. The proposed law changes nothing about the legal status of Israel or its Jewish character. All of the substantive determinations made in the bill are already anchored in existing laws, including in some cases, laws with constitutional standing. In its judgments over the past 20 years, the court’s justices have had no qualms whatsoever about ignoring laws, including laws with constitutional standing, in order to advance their post-Zionist political agenda. For instance, as Sefi Keller explained this week in Mida online magazine, both justices Aharon Barak and Mishael Cheshin disregarded the plain language of Basic Law: Knesset in their rulings. That law prohibits anti-Zionist parties from running for Knesset. Both justices ruled in separate instances that the openly anti-Zionist Balad party could run. There is no reason to assume that a new basic law insisting that the justices respect Israel’s Jewish character will have any impact on them. Indeed, their partners at the State Prosecution have already told the media that if the law is passed, the Supreme Court will overturn it (when asked to do so by EU-funded NGOs). Attorney-General Yehuda Weinstein announced his opposition to the bill ahead of the government’s vote Sunday. Weinstein has a track record of refusing to defend the government to the court when he doesn’t like the government’s position. The unavoidable fact is that the only way to curb the power of the court is to take direct action against the sources of its arrogated powers. The Knesset must amend Basic Law: Human Dignity and Liberty, the basis for the Supreme Court’s post-Zionist actions. It must change the selection process for justices. It must end the anomalous and anti-democratic situation in which the state prosecutors and attorney- general are above elected leaders. It must end the devastating trend in which every senior government appointment, and many Knesset decisions, must receive prior approval from a judge or from a committee led by judges. For many on the Right the Nation State bill was supposed to be the first step on this road. The bill itself was first presented as a consensus measure whose purpose was to fight the international movement to delegitimize Israel’s right to exist. Four years ago, the bill was drafted jointly by Likud MK Ze’ev Elkin and Kadima MK Avi Dichter. Dichter was acting with authority from then-opposition leader and Kadima leader Tzipi Livni. More than a dozen other members of her party co-sponsored it. The coalition agreement for the current government, which both Livni, as the head of Hatnua party, and Yair Lapid, as head of Yesh Atid party, agreed to, stipulates that the government would pass the bill. Passing the bill was not considered controversial. And yet, once the bill was scheduled to be debated last week by the Ministerial Committee for Legislation which Livni chairs as justice minister, she turned rejecting the bill she had previously sponsored and agreed to pass into the be-all and end-all of her tenure in office. Livni’s partner in the grandstanding, Lapid, has similarly attacked the legislation. It is worth recalling that just a week before they became impassioned champions of democracy, both Lapid and Livni voted in favor of a bill that seeks to close the largest-circulation paper in the country. Their support of the bill owed entirely to their opposition to Yisrael Hayom’s political line. In other words, these two valiant defenders of democracy support censorship. But far worse than their hypocrisy and their cheap opportunism is the fact that in opposing this bill – that will change nothing in the way Israel is governed – the two ministers and coalition partners are doing massive damage to the country. By attacking a bill that does nothing but re-state the fact that Israel is the nation-state of the Jewish people as “anti-democratic,” Lapid and Livni are joining the chorus of Israel-bashers worldwide who claim that there is something inherently evil about Jewish self-determination. Livni and Lapid are advancing the growing campaign by Jew-haters to demonize Israel as illegitimate, and Zionism is racist. By castigating this anodyne, redundant law they previously supported as anti-democratic, they are saying that there is a contradiction between being a Jewish state and being a democracy. In all likelihood, their support for the bill owes to the growing herd mentality of the Israeli Left. 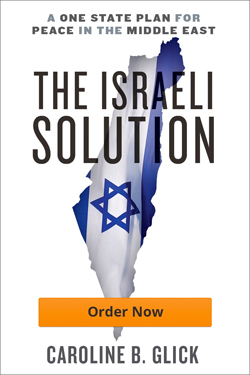 Earlier this month Haaretz, the post-Zionist trumpet, initiated a campaign to demonize the Nation State bill. The paper’s writers said the legislation will destroy Zionism, lead to Nazism, lead to apartheid, and lead to apartheid and Nazism. Rather than dismiss these idiotic claims, Livni, Lapid, their backbenchers and large swathes of the media followed Haaretz over the cliff, vapidly parroting its slanderous and anti-Semitic claims. For Livni, whose party faces electoral destruction in the coming election, embracing the anti-Zionist Left may make political sense. She may pass the electoral threshold by running to the left of Meretz. Lapid is a different matter. His party’s public support has also collapsed. But as the leader of a party that ran as a middle class centrist party, it is hard to see how embracing the position of Students for Justice in Palestine will help Yesh Atid recapture the center. Most Israelis are Zionists and don’t understand what all the excitement is about. Whatever Lapid’s considerations may be, what is clear enough is that his behavior, like that of Livni, and indeed like the behavior of the politicians on the Right who insist that support for the unnecessary bill is a new litmus test for Zionism, is a clear demonstration of the pathologies of Israeli politics. The Right, like the majority of the public that supports it and votes for it, recognizes that the greatest danger to Israel’s democratic system and status as a Jewish state is the radicalized legal system. But today the Right lacks the power to pass the legislation required to curb the power of Israel’s unelected legal rulers. Rather than doing the hard work of running a continuous, relentless campaign to accrue the requisite power to reform the system, politicians on the Right have embraced an unnecessary bill that will do nothing to protect Israel’s future. On the other hand, their counterparts on the Left have shown that the Israeli Left is today largely indistinguishable from the international Left which rejects Israel’s right to exist and rejects the Jewish people’s right to sovereignty and freedom in its homeland. With Haaretz acting as the conduit between the BDS movement and government ministers, politicians on the Left have become unmoored from the basic requirements of national life. In other words, the current maelstrom over the draft Nation State bill shows that Israel’s political Right is far weaker than it needs to be and that Israel’s political Left is far more destructive than it ought to be.